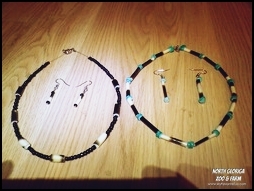 Perfectly matched earrings and necklace set that is great for a gift! Classic design in a full size choker that is bound to get attention. Perfectly matched earrings and necklace set that makes a great gift! 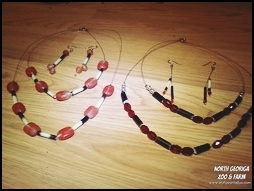 The two sets seen here are available for purchase; other available colors include: turquoise, purple, peach, black, & earth tones for smaller beads. Brown is available in a larger bead like these shown as well as wooden beads. Please specify your choice when ordering. Stylish dangling necklace with a matching pair of dangling earrings. This necklace is currently made with hemp but it is available in metal.